Over the past couple of days a few notable stories have broken in the world of TV animation. First up is the news that Louis C.K (last heard voicing Max in The Secret Life Of Pets) will be returning to animation with TV comedy The Cops. The series was created by C.K. alongside co-star Albert Brooks. The pair will also serve as executive producers with Greg Daniels. A pilot was produced originally for FX, who declined to order a series. TBS stepped in and picked it up instead ordering an initial 10 episodes, due to air in 2018. The Cops (which is a working title) will bolster a growing line-up of adult-focussed animation on the network, alongside American Dad and new upcoming series Final Space and Tarantula. [source]. The first one is a little brief, clocking in at just 15 seconds- but it at least gives you a look at how the series will look. 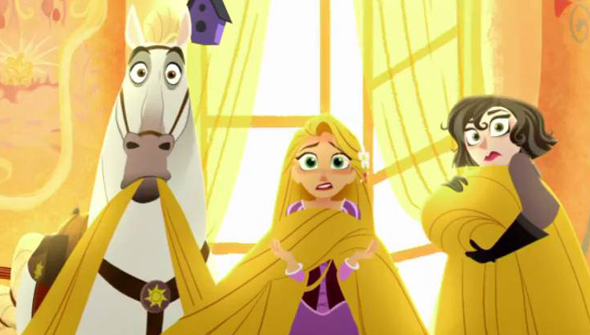 The series will kick off with a TV movie special entitled Tangled: Before Ever After, that will air on The Disney Channel in the US this March. The trailer for this one gives us more to go on- and crucially, explains that the TV film will reveal just how Rapunzel gets her iconic hair back.